50% of total booking fee if cancellation is made 15 days or less prior to arrival date. 100% of total booking fee if cancellation is made 7 days or less prior to arrival date. Ready for another round? Here comes the rest: the Brick Bar, our social area in the ground floor or the roof top events, local gastronomy routes, bike rental and tours...and almost everything you would like to do in an island with our third-party associates, from all kind of water sports to easy rural walking among UNESCO'S World Heritage declared areas. 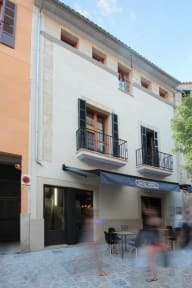 Close to the property you will find the Cathedral, the City Hall, Plaza Mayor, Majorcan courtyards, Arabic Baths, Almudaina Palace, the mains shopping streets or even the beach are within a walking distance! The best markets and restaurants are as close as the rest, so your gastronomic experience is guaranteed. Sounds like too much for a day? Don't worry! Our rooms are the solution: It’s simple: relax, rest and start over again full of energy! 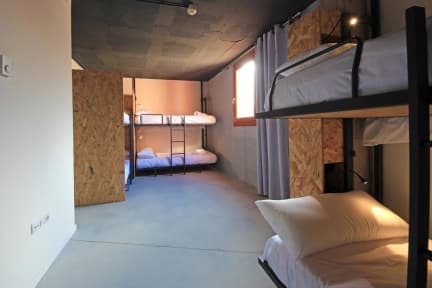 Simple and industrial design, our rooms are tailored to achieve this goal, all of them with AC, private bathroom, good mattress, individual reading lights, LDC Sat TV and much more! Breakfast not included - 2.5 EUR per person per day. Clean and modern hostel with excellent en-suite bathroom facilities for the dorm we stayed in, and comfortable mattresses/pillows. The bar downstairs was trendy. The rooftop was sunny and a great retreat. Easy walking distance to main areas, including the beach. Awesome, affordable hostel with super friendly staff and a chill atmosphere. one of the best hostels I've visited, super clean, renovated, nice the hang at the bar, prices are very fantastic. It was very quiet (in January). I stayed only one night in Brick, on my first night in Palma. It is very well-located, was easy to find and didn't have to walk a lot, and it is also close to the old-town and the sea. It was clean and well-equipped. Staff was friendly and helpful when I approached them with my questions. The staff was extremely kind and accommodating, I would 100 percent recommend this hostel. Good location and comfy beds. Clean and really nice bathrooms. Very much fits the description of bar with rooms, but what a great room! Very comfy bed, and a fantastic bathroom, one of the best hostels for these facilities I've stayed at in Europe. Bar downstairs was good, perhaps the only area not scoring full marks was the staff - I didn't feel that they engaged with guests at any point. But this wouldn't put me off stayibg again, far from it I'm already planning my next stay! The rooms are very nice and clean. Each room has its own bathroom (but bring your own soap). I think they try to assign rooms with people who speak the same language. If you're looking to make friends I would not recommend this place. There is not much of an atmosphere and the staff are not the friendliest. They have a bar downstairs with moderate prices, and a rooftop where you can drink.